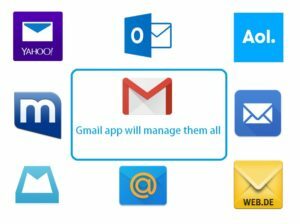 Gmail is the best Android email app for Android and it allows you to add different email accounts. You can get access to all your emails from one app. It has been few months that Google added this feature in their app along with changing the design and making it more material. Most of the Android devices comes with Google apps installed and you will find the Gmail app in the app drawer. How to add a new account in the Gmail app? Make sure you have the latest Gmail app installed in your Android phone or tablet. The app also requires latest Google Play Store Services to be updated as well, if it is not already updated. At the time of writing, Gmail app is on version 5.1.90765967. Get the Gmail app from Play Store. 1a) Just updated to the latest version? Open up the Gmail app and it will give you the first tour and will give you the option if you want to add a new account. 1b) Already using the latest version? Tap on three lines on top-left corner or slide your finger from the left edge. This will open up the side bar. Scroll down and click on settings. It will give you option to add account. 2) Click on Add account and a new pop up will appear on the screen. Select Personal (IMAP/POP) and press OK.
3) Enter the Email address you want to use. i.e. : username@yahoo.co.uk or username@outlook.com or username@aol.com and press Next. 4) Enter your email’s password in the password box and press Next. 5) If your entered details are correct the app will take you to the next screen where you can choose Sync frequency and other important options. Then press Next. 6) At this stage you can assign a different name for this account and set up your name displayed on outgoing messages. And, press Next. The app will now sync all your mails from different provider. You can check and send emails from the new account you setted up. You can also add more accounts if you like. To switch between your email accounts, bring up the side bar and look at the top. Click on account you want to check. Enjoy the best Android email app to manage all your email needs. If you are using some private email services, you might need to contact your admin for the correct settings and you can enter them manually at step 3. Please share with your friends if you think this might be useful for them. You can use the social sharing buttons to share.